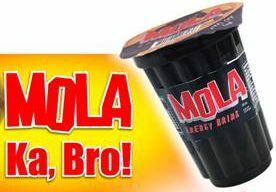 here’s Mola, the poor man’s substitute to the more mainstream energy drinks locally available in the market. pegged at around half the usual price of, say, Red Bull, but the caffeine content is the same. oh alright, for the poorer man, you’ve got Extra Joss, but i really cant stand the taste of it. just about done with 60% of my task at work. phooey.